Om (top, second from right), commonly associated with certain groups of Hindus or Buddhists. Gear (bottom, third from right) should appeal to a Steampunk audience or would make a great gift for someone mechanically inclined. 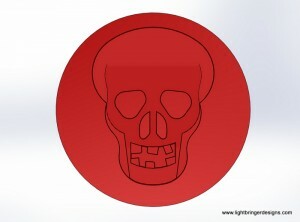 Skull – This was our most requested idea for a new stock image and is now available for purchase. The Dragon and LD with crossed swords (bottom right) are examples of custom wax seal designs that are possible, including personalized monograms with or without a background symbol. Of course all other symbols seen here are still available on the Shapeways Store, and don’t forget about sealing wax. Limited quantities of some seals are in stock for immediate shipment and a slight discount – avoid the Shapeways 14 business day building time! Inquire through the Contact page for more information. This entry was posted in New Products and tagged Awen, gear, New Products, om, signet rings, skull, wax seals by lightbringer. Bookmark the permalink.